Pool B looks a bit like what we are used to from Pool A: a dominant top seed, but a glut of strong squads beneath that will take no quarter in trying to reach prequarters. Fury reprises their role as the intimidating favorite, and hopes to start a run to a national championship the same way they did last year, when they throttled all of their pool play opponents. Each of 6ixers, Phoenix, and Traffic have shown the characteristics that could make them overperformers this weekend, but one of them will be removed from the equation after pool play. #2 San Francisco Fury has been in the final or semifinals of Nationals every year since 2004, the only team in the top four to have achieved such a feat.3 They do not mess around when the stakes are highest, as shown by their gritty win last year in the final against Brute Squad. Fury’s roster is deep, strong, and passionate. But this year, we have seen some cracks in their armor; they have already lost to Riot, Brute Squad, and Molly Brown, once apiece. While there is almost no doubt that they can beat the three other teams in their pool and win their quarterfinal game, they will most likely have a difficult game against Riot in the semifinals and another against the winner of a likely Brute Squad and Molly Brown in the final. Simply put, Fury dominates against weaker teams. Their competition at Regionals scored a combined 10 points during all of pool play and a total of 22 points across the entire weekend. When they are playing with confidence, they take calculated risks that make their offense hard to shut down, convert breaks easily, and outrun or outsmart any opponent. When they face truly elite teams, however, they sometimes execute poorly or cannot find their stride. If they can adjust and refocus, they are still able to win – they have beaten Riot twice this season, once by six points and once by three, and have beaten Molly Brown by four points – but if they cannot get back in sync, they look uncertain on offense and hectic on defense. This is a position they’re not used to being in, and it shows – they lost to Riot by five points at Eugene Summer Solstice, their biggest loss of the season and a frustrating game for the entire team. 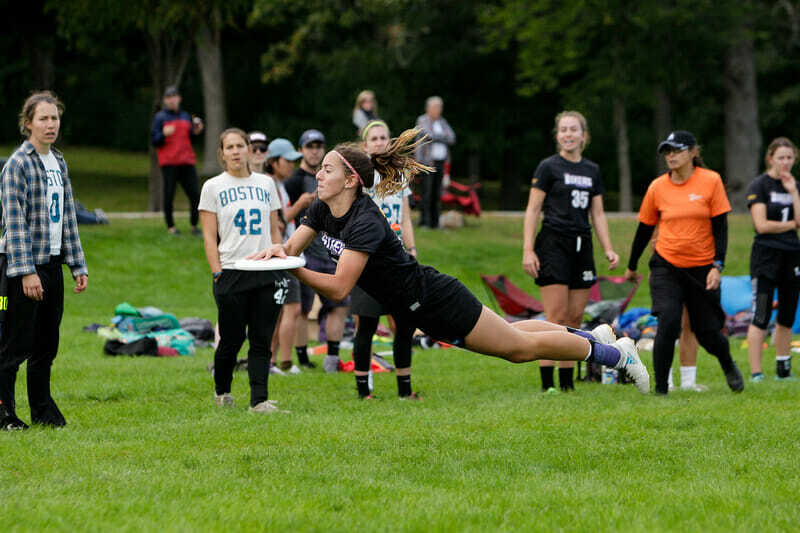 The team is anchored by veteran handler Alex Snyder, who is complemented perfectly by their diverse range of cutters and is incredibly calm with the disc even when facing unfamiliar defenses. But the reigning Offensive Player of the Year is by no means the star of the show – everyone on Fury is capable of making huge offensive plays, earning game-changing blocks, or destroying another team’s defense with a single throw. They distribute goals and assists incredibly evenly all the way down their roster and are more than happy to send out varied lines of athletes during a single game, rather than relying on a strict offensive and defensive starting line. With the addition of Sarah “Surge” Griffith and a new utilization of switch defense, they are looking primed for another deep run. Fury has beaten all of the top teams at Nationals by multiple points this season, with the exception of Brute Squad. If they can defeat Riot a third time in the semifinals, they will get a chance to avenge their 15-11 loss to Brute in the final of the U.S. Open. But this season has shown that any of the top four teams can beat any of the others when they’re playing their best possible game, so anything is possible. #8 Toronto 6ixers have had a remarkable third season, losing only four games all year: two blowouts to Brute Squad,4 a four point loss to Scandal, and a two point loss to Rival. The big loss to Boston in the Northeast final isn’t surprising and may speak to the ceiling for this Toronto squad, but it will not distract them from making a push at Nationals where they will add an All-World talent in Australia’s Cat Phillips. The Canadians’ offensive line plays with a flashy style and has a strong deep game, thanks to athletic players such as Brittney Dos Santos, still a teen, and 21 year-old Laura Kinoshita. Lauren Kimura is a star in her own right and with young center handler Anouchka Beaudry discontinuing her participation with the team for the Club Series, Kimura has taken on a pivotal O-line role. The team also has Miriam Tingle, Molly Lewis, and several other members of Canada’s U24 roster. In pool play, the 6ixers should be able to defeat their fellow Canadians when they face Traffic in their first game of the day. The highest-profile game between the 6ixers and Traffic was undoubtedly the final of the Canadian Ultimate Championships in 2017, which 6ixers won in what was considered a huge upset at the time. This year, they are ranked higher and have the added experience from WUCC and the U24 World Championships to help them. They may have a bigger challenge when they play Phoenix next, but that team will be coming off of a game against Fury and most likely will be much more tired. If the 6ixers can hold on to the second spot in the pool, they will face the third team from Pool C in prequarters – potentially Rival, one of the only teams to beat them this year. That game could go either way, but if they won, they would face Brute Squad next. Brute hasn’t lost a single game this year and it would be shocking for the 6ixers to end that streak. #9 Raleigh Phoenix has only lost three games all season – against Riot, Scandal, and Ozone, the #3, #5, and #7 ranked teams heading into Nationals. This year’s Elite-Select winners, they have defeated Nemesis, Rival, Schwa, and Heist, and can be expected to do the same if they face any of those teams in crossovers or bracket play. The reason for this success is largely thanks to Jenny Wei, who is an absolute beast on the field. The Callahan finalist was the First Runner-up for D-I Women’s 2018 Player of the Year and she led the division with 24 blocks at this year’s D-I Nationals. More recently, she had 14 goals and 12 assists at the TCT Pro-Elite Challenge – more than most of her teammates combined. Phoenix veteran Jessi Jones has also maintained a big role this season, and leads with poise after several years of captaining and coaching over her career. You may remember her name from her brief stint as the only female athlete in the AUDL in 2015, but since then she has been an integral part of the Raleigh Radiance and the fight for gender equity on the professional field. When she’s not fighting off-field battles, she’s reeling in goals and notching assists at a frightening pace. Along with emerging handler Ashley Powell, Jones and Wei are the focal points of the Raleigh offense. The bottom line is that Phoenix has what it takes to hold their own against the bottom half of the teams at Nationals and could put up a serious fight against 6ixers. If they stay at third in this pool, they will face the second-place finisher from Pool C in prequarters – this will most likely be Ozone, who beat them 15-7 in the final of Southeast Regionals. However, if they can earn the second spot or there is a mix-up in Pool C, they would potentially face Rival in prequarters. They could win that game and progress to quarterfinals, but given their multi-point losses to Riot and other elite teams, it is doubtful that they could progress further. #14 Vancouver Traffic made it all the way to the quarterfinals last year, ultimately losing a blowout game to Fury, who were on the path to a national championship. This year they are seeded much lower, and for good reason – they have lost games to teams like Portland Schwa and Seattle Underground, as well as their pool-mates Phoenix by a five point margin in July. If their previous games against Fury are any indication, they will probably lose by several points. That being said, Traffic does occasionally show flashes of their former brilliance – they took Riot to double game point at Regionals and beat both Riot and Nightlock at the Bay Area Invite in August. At that same tournament, they even held a brief lead against Fury thanks to an early break, but soon lost it (and the game). The Canadian team has made it to quarterfinals for each of the last five seasons, but they are sitting at the bottom of a pool full of talent this year. They will have to beat at least one of the other teams in Pool B to even make it to prequarters, and it won’t be Fury. That means they will have to do battle with the 6ixers or Phoenix in a way they have only hinted they’re capable of so far this year in order to keep their season alive. Expect them to call tight lines and rely heavily on players like Jennifer Kwok and Catherine Hui, who have been goal scoring machines for the team. Handlers Laura Mason and Rachel Moens have a crafty field sense and can throw their cutters open in the deep space with confidence, but the team as a whole needs to work on trusting their system in order to play a consistent game against tough competition. If Traffic can beat one of the other teams in Pool C, they face Ozone or potentially Rival, who they beat at the Pro-Elite Challenge. While any progress further than that seems unlikely, Traffic has proven this season that they can roll with the big dogs and almost anything can happen. Don’t count them out too soon. Comments on "Club Championships 2018: Pool B Preview (Women’s)"